Tulalip Heritage Hawks take on Shoreline Christian Chargers in the 2016 District 1B boys basketball tournament. The Tulalip Heritage Hawks basketball team finished the regular season with a 12-8 overall record, 11-4 within the league. That was good enough for the Hawks to qualify as a #2 seed in the 2016 District 1B boys basketball tournament. Their opening round opponent was the Shoreline Christian Chargers. The game was played on Friday, February 5, at Shoreline High School. In the 1st quarter, both teams went bucket-for-bucket almost the entire quarter before the Hawks closed out on a small run that gave them a 21-17 lead. The 2nd quarter saw seniors Willy Enick and Robert Miles play a very effect two-man game, leading to high percentage shots for the Hawks. The Hawks played a near flawless 1st half, only committing four turnovers, and took advantage of their quality shots to take a 40-30 halftime lead. At halftime the Hawks coaching staff commended the boys on their overall effort and commitment to playing smart basketball. The only bit of constructive criticism was the team wasn’t boxing out and that if they focused on that the Hawks would take the game easily. Starting the 3rd quarter, the Hawks focused in on their team rebounding and boxing out. It made a huge difference as they were able to limit the amount of Charger possessions and push the tempo, the way the Hawks like it. Willy continued his impressive shooting, as he caught fire to the tune of making five shots in a row before finally missing on a long 3-point attempt. In the end, Willy led all scorers with 34 points and a season high 10 assists, while Robert had 17 points and 12 rebounds to secure a first round victory, 76-55. 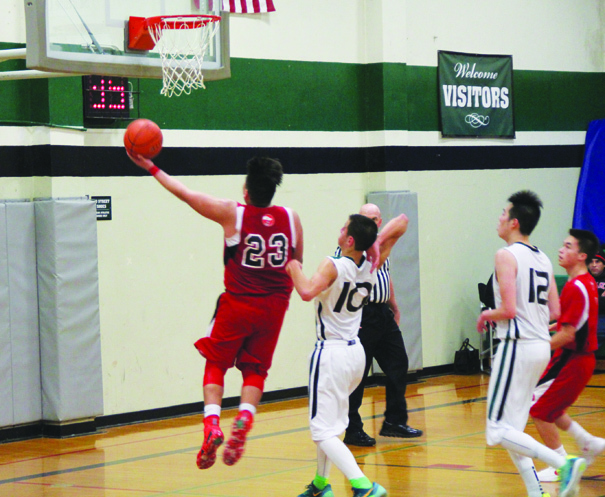 This entry was posted in Sports, Tulalip News and tagged Basketball, Heritage Hawks, Tulalip. District by Kim Kalliber. Bookmark the permalink.